Along with Seinfeld and Frasier, Friends dominated the must-see TV of the 1990’s. 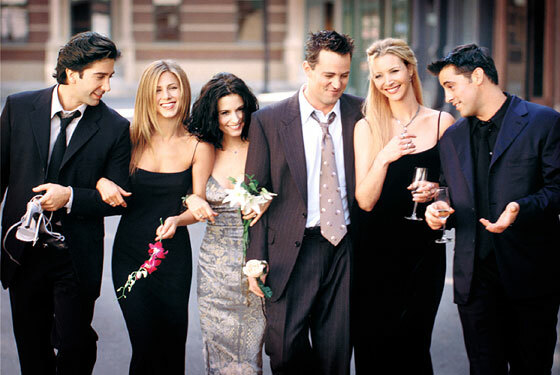 Winner of innumerable television awards, the show features the lives of six friends in their late-twenties/early-thirties living in New York City – Monica Geller (Courteney Cox), Phoebe Buffay (Lisa Kudrow), Rachel Green (Jennifer Aniston), Ross Geller (David Schwimmer), Joey Tribbiani (Matt LeBlanc), and Chandler Bing (Matthew Perry). The six friends spend the majority of their time in a coffee house named “Central Perk” or in either Monica’s apartment or Joey and Chandler’s apartment.